CFCA staff members in Kansas City took a symbolic walk of solidarity on Dec. 29, the same day that the 8,000-mile Walk2gether started in Guatemala. Approximately 60 employees met in the community room at 9 a.m. to hear a report about the launch of Walk2gether, pray for the safety of the walkers and then make a short walk of solidarity. Because a pre-Christmas blizzard left high snow drifts and dangerous ice on sidewalks, the walk was held inside instead of outdoors as originally planned. 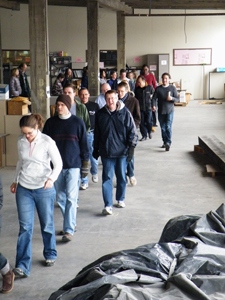 The Kansas City walkers followed a mile-long route marked by yellow boot prints inside the warehouse that is part of the CFCA headquarters. The walk in Kansas City occurred at about the time the Guatemala walkers, led by CFCA President Bob Hentzen, were scheduled to make their first stop for breakfast. They began at about 4 a.m. and were due to walk 24 miles on the first day of the journey. Other CFCA projects and employees held their own symbolic events for the Walk2gether kick-off. At the Monrovia project in Liberia, staff and sponsored members spent the day volunteering at community hospitals. In Ecuador, the Guayaquil project hosted solidarity walks 10 kilometers in length in areas where they have sponsored members. The Bluefields subprojects in the northeast corner of Nicaragua will have a night vigil, where families, sponsored members and staff will join together in prayer. Throughout the duration of the walk, they will hold morning prayers and ask God to give both physical and spiritual strength to the walkers and to all of the families who will accompany them on this journey. One employee, Jerry Gladbach of the Child Services department in Kansas City, made his own show of support for Walk2gether. He strapped cleats onto winter boots and walked 1-1/2 miles to work over snow and ice. “I’m trying to be in solidarity with the walkers,” Gladbach said. During the community meeting in Kansas City, CEO Paco Wertin led a prayer of blessing for the walk and its participants. Visit Walk2gether.org to learn more about why Bob is walking. You can also send messages of support and encouragement that Bob will share with the families of sponsored members and the CFCA staff in the communities he visits. God Bless you Bob, my thoughts and prayers are with you every step of the way.